The two teams that met for the championship of the American Football League on December 29, 1968 had already met several weeks earlier with memorable results. In the so-called “Heidi Game”, in which television viewers on the East Coast had the last few minutes of the contest pre-empted by a showing of the children’s classic “Heidi”, the Oakland Raiders had scored twice in short order to defeat the New York Jets. Now they were matched up again at New York’s home venue. The Jets, built into a winning team by Head Coach Weeb Ewbank, had topped the Eastern Division with an 11-3 record. 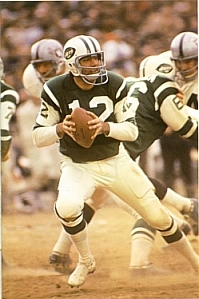 The explosive offense was directed by QB Joe Namath (pictured above), who had outstanding targets in wide receivers Don Maynard and George Sauer as well as TE Pete Lammons. The ground game was sound with FB Matt Snell and HB Emerson Boozer. The overlooked defense was especially tough against the run and contained AFL All-Stars in ends Gerry Philbin and Verlon Biggs, DT John Elliott, and MLB Al Atkinson. PK Jim Turner, who kicked a record 34 field goals, added a further scoring dimension. The Raiders, under Head Coach John Rauch, were the defending AFL Champions. Despite a spate of injuries, they had gone 12-2 but still had to defeat the Chiefs in a playoff to again win the Western Division. QB Daryle Lamonica was still highly effective with his passing and, in addition to WR Fred Biletnikoff, had a new and speedy deep threat in WR Warren Wells. Rookie HB Charlie Smith entered the starting lineup at midseason with good result. With CB Kent McCloughan out due to knee surgery, rookie CB George Atkinson showed potential but had been burned badly by Maynard in the previous encounter. Weather conditions were windy and cold at Shea Stadium, where 62,627 fans were present. The Raiders had constructed a small makeshift shelter for their players, but AFL President Milt Woodard ordered it taken down because it was obstructing the view for several rows of fans. Oakland had the first possession and was forced to punt, with Mike Eischeid’s poor 28-yard kick giving the Jets good initial field position. With Pete Lammons and Emerson Boozer spread wide, New York moved 44 yards in four plays. Namath hit Don Maynard twice for 14-yard completions, the second good for a touchdown. In between, a pass interference call on Atkinson helped the drive along. The Raiders missed a scoring opportunity when George Blanda attempted a 45-yard field goal into the wind that hit the crossbar and bounced away. Late in the first quarter, Jim Turner added a 33-yard field goal to make it 10-0 in favor of the Jets. 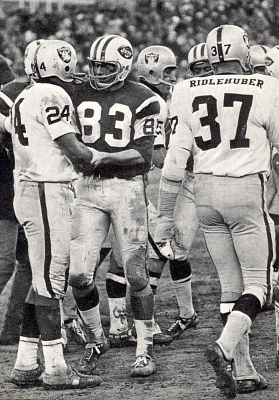 Daryle Lamonica (pictured at left) got off to a poor start, completing just one of his first 13 passes. But the Raiders began to move offensively late in the opening period as Lamonica started to find the range. He completed a screen pass to HB Pete Banaszak for 11 yards and followed up with throws to Fred Biletnikoff for 15 yards and to FB Hewritt Dixon for 23 yards on the first play of the second quarter. A pass to Biletnikoff, running a post pattern, was good for a 29-yard touchdown as he outmaneuvered CB Johnny Sample (Sample was subsequently replaced by Cornell Gordon). Turner missed a 44-yard field goal attempt but connected from 36 yards late in the second quarter. Blanda booted a 25-yard field goal just before halftime to narrow the tally to 13-10 at the intermission. 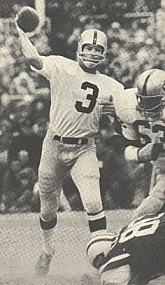 In the third quarter, Warren Wells caught a pass for a 40-yard gain before being brought down by SS Jim Hudson at the New York six. The aroused Jets defense held on the next three plays as Charlie Smith was downed at the three and again after another gain of a yard, and Dixon was stopped on the third down play at the one. Oakland was forced to settle for a Blanda field goal and a tie score of 13-13. With just under a minute remaining in the period, the Jets culminated a 14-play, 80-yard drive with Namath tossing a 20-yard touchdown pass to TE Pete Lammons to re-take the lead. The Raiders surged back as Lamonica completed a pass to Biletnikoff for a 57-yard gain and Blanda kicked a 20-yard field goal. On the first play following the ensuing kickoff, Atkinson intercepted a Namath pass and returned it 32 yards to the New York five. Banaszak scored a five-yard TD that put Oakland in the lead by 23-20. The Jets struck back swiftly. Following a 10-yard completion to Sauer, Namath fired to Maynard for a 52-yard gain and again to Maynard for a six-yard TD with 7:47 remaining in the game. Oakland drove to the New York 24, but chose to try and convert a fourth-and-ten and Lamonica was sacked by Verlon Biggs. With two minutes to go, the Raiders were again threatening to move back in front. Lamonica passes to Biletnikoff for 24 yards and Wells for 37 advanced the ball to the New York 12. But a lateral intended for Smith went awry and LB Ralph Baker recovered it for the Jets to extinguish the threat. The Raiders had one last chance with 42 seconds remaining as they took over at their 22 yard line but fell short after advancing to near midfield. The Jets were AFL Champions by a score of 27-23. Oakland had the edge in total yards (443 to 400) although the Jets had more first downs (25 to 18). New York was effective against the running game as the Raiders gained just 50 yards on the ground. The teams punted a combined 17 times, with the Jets accounting for 10. Joe Namath completed 19 of 49 passes for 266 yards with three touchdowns and an interception. George Sauer (pictured below) caught 7 of those passes for 70 yards while Don Maynard gained 118 yards and scored two TDs on his 6 receptions. Matt Snell rushed for 71 yards on 19 carries and Emerson Boozer contributed 51 yards on 11 attempts. For the Raiders, Daryle Lamonica went to the air 47 times and had 20 completions for 401 yards and a touchdown. Fred Biletnikoff had 7 catches for 190 yards and a TD and Warren Wells added 83 yards on his three receptions. Hewritt Dixon ran for 42 yards on 8 carries and added another 48 yards on 5 catches. Charlie Smith was held to just a yard on five rushing attempts. The Jets went on to pull off a huge Super Bowl upset of the NFL Champion Baltimore Colts and repeated as Eastern Division champs in 1969. Oakland again placed first in the Western Division in ’69 but, due to a revised playoff format for the AFL’s last pre-merger season that allowed second place teams to qualify, ended up losing again in the league title game, this time to the Chiefs, who had finished behind them in the standings.